The morning (last week) I started this post I was photographing South Tufa at Mono Lake in 26 degree temperatures. It’s hard to believe that less than three weeks earlier I was wearing a tank top, shorts, and flip-flops while photographing orchids in Hawaii. And later today I’m off to Moab, Utah. I’d taken my Hawaii workshop group to Lava Tree State Park, long a personal favorite spot for its quiet beauty and intimate scenes. 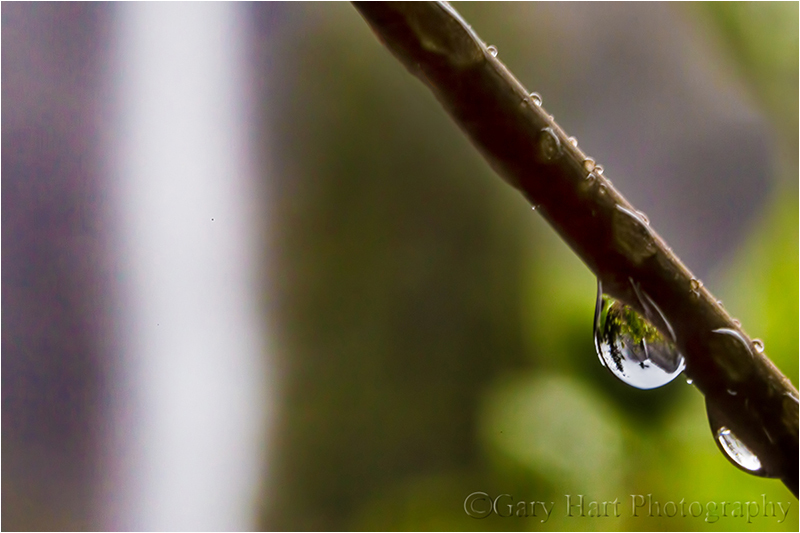 A recent heavy downpour had soaked the ground and left virtually every square inch of foliage glistening with raindrops. Recognizing an opportunity for some extreme close-focus photography, I immediately loaded my macro and extension tubes into my bag and herded my group onto the loop trail that circumnavigates the park. In the shade just off the trail at the back of the park, a solitary, raindrop-laden orchid caught my eye—exactly what I look for when close-focus photography is my goal. Unfortunately, even with my tripod extended to its maximum height (6 inches above my head), the flower was a few inches too high to photograph at what I considered a good angle. No matter how I tried, I couldn’t find a position that allowed me to emphasize the orchid and its raindrops without blowing out the brilliant sky in the background. Tugging at the back of my brain as I stalked my subject was that frequently uttered photographic mantra, “Never blow the highlights.” But rather than give up, I stood back and considered my options. Photographic rules are usually based on sound, proven reasoning that guides the neophyte to competent, appealing images. And while I’ll acknowledge that a broken photographic rule can indeed ruin an image, I’ve also spent my entire photographic career espousing the creative merits of breaking rules. If true artistic achievement means doing something new, and there’s already a rule for something, doesn’t that mean it’s been done? In other words, genuine creativity requires breaking the very rules that are supposed to lead to good images. So what was my problem? Among the most ubiquitous and absolute pieces of photograph dogma is, “Never blow your highlights!” And for the most part I agree that blown highlights ruin an image—in fact I’ve spent a lot of time writing about how to deal with difficult light, and it’s all been based on the premise that we need to save the highlights at all costs. Over the years I’ve written and spoken about exposure techniques, graduated neutral density filters, HDR blending, and silhouettes to save the highlights. In this case, after exhausting my conventional solutions, it would have been far easier to move on to a different orchid. But I liked this orchid, with its rich color and shimmering raindrops, and the more time I spent with it, the more I liked it. So what if I make it okay to blow the highlights? What if instead of trying to subdue them, I made the highlights a feature of my scene? Suddenly unshackled, an entirely new world of possibilities opened for me. I eyed the background and realized that turning the bright sky white, I’d have a striking contrast for the properly exposed orchid. Furthermore, the sky breaking through the canopy overhead would be softened by a paper-thin depth of field—if I could find the right aperture, the effect could be quite appealing. To focus as close as possible, I added a 15mm extension tube to my macro and worked on identifying the angle of view and front/back relationships, eventually refining my the composition in small increments until all felt right. To mitigate a very slight breeze, I set my ISO to 800 and metered on the flower, ignoring the violently flashing highlights. The final piece of the puzzle was determining the f/stop that would give me the best effect. Rather than trust the result on my LCD, I ran the range of f/stops from f/2.8 to f/16, increasing my shutter speed to keep the exposure uniform. Regardless of the f/stop, with my lens more or less parallel to the orchid’s stem, I had a fairly large area of sharpness that included all of the raindrops, most the flower, and much of the stem. I know this scene won’t garner as much attention as a vivid sunrise or dramatic lightning strike, but really like this image. So I guess the moral here is if you find yourself bound by rules, aggressively seek the unconventional. If a “rule” applies, go ahead and follow the rule for a shot or two, then challenge yourself to break it. You may end up with more failures than successes (but of course nobody needs to know that), but I’ll bet your successes will turn out to be among your favorite images. Photography is an art of subtraction—presented with a complex world, we identify and organize objects of visual interest and (ideally) do our best to eliminate everything else. It’s this last point that’s often overlooked. The best pictures often work as much for what’s not in them as for what’s in them. Most photographers have no problem seeing what to put in their images, but many struggle with what to leave out. Or how to do it. Anything in your frame that doesn’t enhance it is a potential distraction. Removing distractions is often as simple as tightening the composition, or repositioning the camera. For example, admiring a dramatic waterfall in the distance, you might walk around until you find a colorful bouquet of wildflowers for your foreground—so far so good. With your camera at eye level, you frame the scene with the flowers at the bottom and the waterfall at the top. Click. The problem is that you also included a vast empty region in the middle of the frame, a region that does nothing more for your image than occupy space. The solution is as simple as dropping your camera to ground level, allowing you to subtract the empty space and replace it with larger flowers and waterfall (because with the flowers and waterfall more aligned, you can increase the focal length). But compositional adjustments are only the beginning. Where most people stumble is when they have an opportunity to further simplify an image by incorporating the areas of their camera’s vision that differs most significantly from their own vision: light, focus depth, and motion. Photographers frequently lament their camera’s limited dynamic range. And while extra dynamic range in a camera is great, limited dynamic range creates great opportunities to remove distractions and emphasize shape over detail. Metering and underexposing the highlights in a backlit scene can saturate color and hide distracting details in blackness. I try to find striking subjects that stand out against the sky. Hilltop oak trees work well for this, but I can think of no subject in nature more suitable to silhouette photography than El Capitan and Half Dome in Yosemite. And since a crescent moon is always in the brightest part of the sky just before sunrise or after sunset, I always look for an opportunity to pair a waning crescent against Yosemite’s striking skyline. But this approach isn’t limited to silhouettes. In the image at the top of this post, I didn’t want anything to distract from the poppy’s graceful curves, so I positioned the poppy against deep shade and underexposed the scene. This saturated the rich color and blackened everything that wasn’t poppy. And using dynamic range to subtract distractions isn’t just about turning shadows black. Don’t like a blank blue sky? Metering on a shaded subject against a blue sky can completely blow out the highlights, creating a striking white background for your primary subject. While I’ve used pretty much every lens in my bag to blur my backgrounds (and foregrounds), I most frequently use telephoto and macro lenses, often with extension tubes. Not only does this approach help the primary subject—or specific aspects of the primary subject—stand out, when executed properly it can eliminate virtually any background distraction. The most important thing to remember is that even when it will be blurred beyond recognition, the background matters. of whitewater might be overdoing it a bit, the cliché label ignores the fact that blurred is often the only way to render moving water (ever try freezing a waterfall or churning cascade in shade or overcast?). Regardless of your position on blurred water, detail in moving water can create a distraction that competes with your primary subject for attention. Smoothing moving water to one degree or another subtracts this distracting busyness. Motion blur isn’t just about water—pretty much anything that moves can be softened or eliminated with motion: clouds, blowing leaves and flowers, stars, and so on. While it’s not landscape photography, a device employed by architectural (and other) photographers is adding many stops of neutral density to slow the shutter speed so much that people and vehicles moving in the scene completely disappear. Regardless of the object that’s moving, as with narrow focus depth, softening the secondary areas of a scene also helps the primary subject stand out by allowing your viewers to focus all their attention where it belongs. Because of the zero-sum relationship between photography’s exposure variables—changing one variable requires a complementary change in another—controlling light, depth, and motion is difficult-to-impossible unless you get out of the full auto exposure modes and start making your own exposure decisions. While it can be done in Aperture or Shutter Priority modes, I find Manual metering works best for this level of control. So, if you don’t have enough understanding of metering to shoot in Manual mode, that’s the place to start. Last year, a busy spring schedule and mediocre wildflower bloom conspired to thwart the wildflower photography I love so much. Vowing not to let that happen again this year, a few days ago I packed my gear and headed for the hills with fingers crossed. My goal was a familiar canyon off of Highway 49 in the foothill Gold Country south and east of Sacramento. This would be the maiden voyage for my brand new Sony 90mm f2.8 macro, and I was really looking forward to seeing if it’s as good as everyone says it is. Not only that, this would be my first wildflower shoot since switch from Canon DSLR to Sony mirrorless nearly a year and a half ago (!). On the drive I’d been streaming a Giants Spring Training game, but turning up the canyon I lost my signal, so I opened the Music app on my iPhone, put it in Random mode, and was immediately distracted by an entire hillside of poppies unfolding before me. Each bend in the road seemed to be trying to outdo the one before it, and I was several curves up the road before my ears caught up with my eyes. Of the 5000 or so possibilities on my phone, what I heard was Tom Petty telling me, “You belong among the wildflowers….” (true story). A sign, definitely a sign. I followed the road to the end to identify the places I wanted to return to. On the drive back I stopped at my first choice and stayed until darkness and rain (not necessarily in that order) drove me out. I started with the macro, but before I was done I’d used every other lens in my bag too: 16-35, 24-70, and 70-200 (and would have used the 150-600 if I hadn’t loaned it to my brother a couple of days earlier)—with and without extension tubes. With the sun already behind the hills and rain on the way, light was limited, and fading. There wasn’t much wind, but there was just enough flower-swaying breeze to concern me. My f-stop choice was completely tied to the creative side of my composition (selective depth of field), leaving ISO as the only exposure variable for controlling my shutter speed. Rather than guessing before each shot exactly how fast the shutter needed to be and dial in just enough ISO to get there (and remember to adjust each time my f-stop changed or I added extension), I just cranked the ISO to 4000 and went to work. Problem solved. The Sony 90mm macro was as good as advertised. And I can’t tell you how pleased I am with the high ISO capability of the Sony a7RII. Putting my wildflower images up on my large monitor at home confirmed that everything that was supposed to be sharp was indeed sharp, and the noise at 4000 ISO was minimal and easily managed without detail loss—even the images I shot toward the end, in a light rain and fading light, at 6400 ISO were just ridiculously clean. This ability to push my ISO threshold allows me to shoot scenes I’d never have considered before. Along with the dynamic range and night photography capability, it’s another Sony game changer for me. The a7RII is exceptional, but regardless of the camera you use, I encourage you to test its high ISO capabilities before you find yourself in a situation where ISO matters—you may be surprised by its capabilities. Another thing I enjoyed about shooting macro with the a7RII was the ease of achieving precise focus. With depths of field measured in millimeters, sometimes fractions of millimeters, identifying the focus point and getting it perfectly sharp is imperative. With my recent Canon DSLRs (1Ds Mark III and 5D Mark III) I’d become a real convert to live-view focus, but glare on the LCD can sometimes make seeing well enough to get precise focus difficult. That problem disappears completely with the ability to view the scene in the viewfinder. I had so much fun last week, I’ll be going back as often as possible, until the hills brown and the wildflowers fade. With all the rain promised for the next couple of weeks, that might be quite a while—maybe all the way until dogwood season in Yosemite. Life’s good. When I started photographing nature, I couldn’t really identify (nor did I think about) what exactly it was that I wanted to show people—I just knew that I wanted to enjoy and record beautiful scenes. This was good enough for me, and the fact that thousands (millions?) of other photographers were capturing similar images, of similarly beautiful scenes, was no concern to me. But when I decided to make nature photography my livelihood, I realized that merely capturing beautiful scenes, no matter how beautiful, wouldn’t be enough—to truly succeed as a nature photographer meant distinguishing myself from the countless other photographers also capturing beautiful images. Uniqueness. Striving for uniqueness doesn’t mean I don’t photograph the clichés (I mean, if it’s beautiful sometimes I just can’t help myself), it just means that I never set out to photograph something that’s already been photographed, in a way that it’s already been photographed. And I’m not satisfied if I’m merely duplicating something that’s been done before. Of course uniqueness is in the eye of the beholder. But this isn’t really about whether or not I’ve succeeded in creating uniqueness—it’s about the realization that simply striving for uniqueness has helped me see nature better, and has made me a better photographer. Another insight that has influenced my photography is the understanding that my favorite moments with nature are the private ones. This insight has led me to photograph only scenes that allow me to imagine a world untouched by the hand of Man. Browse my galleries and you’ll get a pretty good idea of the places and things that make me happiest: the moon and stars, water, weather pull me with or without a camera. My connection to Yosemite predates my memories. And Hawaii is simply heaven on Earth. I could go on. And eliminating the hand of Man is why some of my previously best-selling images, scenes that include skylines, bridges, roads, and people are no longer in my portfolio. While I enjoy viewing others’ images of these scenes, they’re just not what I do. Something else I’ve come to recognize is the desire to use my camera to reveal aspects of nature that exist beyond human vision, to help people see (and to remind myself) that “reality” is not limited to human experience. In my May 20 post I shared a colorful moonbow—quite “real” despite being invisible to the human eye—that is a great reminder of the universe beyond our narrow human senses. And the dewdrop in today’s image—smaller than a match head, clinging to a blade of grass no larger than a matchstick—is a reminder that not only is our universe infinitely large, it’s also infinitely small. 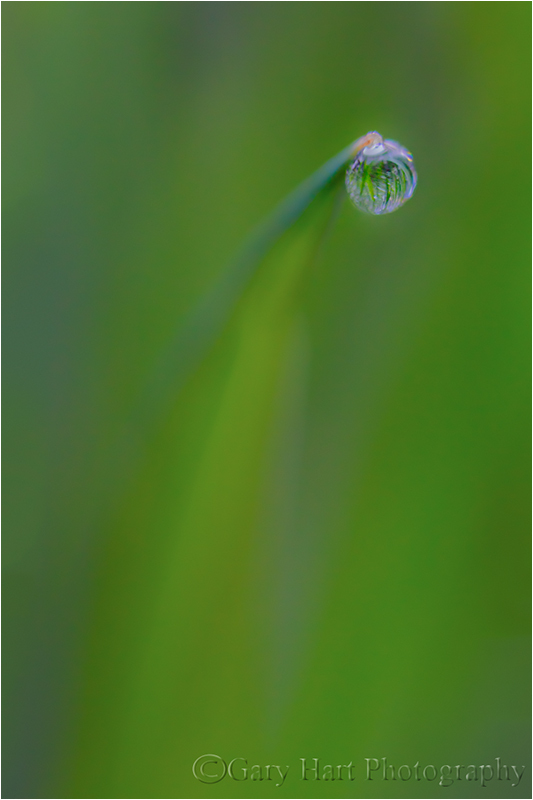 This little scene was just one blade of grass, one dewdrop, among millions in a meadow beside Yosemite’s Merced River. I was helping a workshop student who was struggling for inspiration in a much larger Yosemite scene that included Cathedral Rocks, El Capitan, the Three Brothers, and a reflection. We’d been talking about ideas when I turned to answer a quick question from another student; when I turned back around she was on the ground about ten feet away, examining the tiny dewdrops everyone in the group (myself included) had ignored all morning. I dropped down to the ground beside her to see what she had found and immediately forgot the larger scene. Because I’d photographed that large scene so many times, I’d arrived already knowing that I’d wrung all the uniqueness potential from this spot years ago. But getting eye-level with a blade of grass exposed a world that may as well have been invisible for the amount of attention it had received, a world that had been there all along, with this and every previous visit, in one form or another. I suddenly saw that each blade of grass, each dewdrop, had its own personality—relationships and idiosyncrasies that distinguished it from every other blade of grass and dewdrop. Sprawled on the ground, as close as I was to my subjects, I was still in the realm of my own limited human vision. But I had my camera, with its very own reality. I replaced the ultra-wide lens (that pretty much automatically goes on each time I visit this spot) with my 100mm macro and got even closer—but why stop there? Stacking all three of my extension tubes (68 mm of extension) between my camera and macro, I had essentially shrunk myself enough to be granted insight to the previously unseen world within the dewdrop. Here we go, I thought as the inverted scene within my dewdrop snapped into focus, this is is what my camera is really for. Just like the moonbow, this was an opportunity to reveal an aspect of nature to which most of us are completely oblivious. And I hope the next time I walk across a lawn and lament the wetness that has seeped through though my shoes and into my socks, maybe my irritation will be eased by the memory of the beauty of those dewdrops and the world they contained. I knew the dogwood bloom in Yosemite had really kicked in this week (quite early), so when the forecast called for rain in Yosemite on Tuesday, I cleared my schedule and headed up there for the day. It turns out I only got an hour or so of rain and solid cloud cover before the sun came out and started making things difficult, but it was still worth the drive. On my way out of the park that afternoon I stopped at the Bridalveil Fall view turnout on Northside Drive, spending about an hour lying in the dirt with my 100-400 lens, trying to align dogwood blossoms with Bridalveil Fall (about 1/3 mile away). 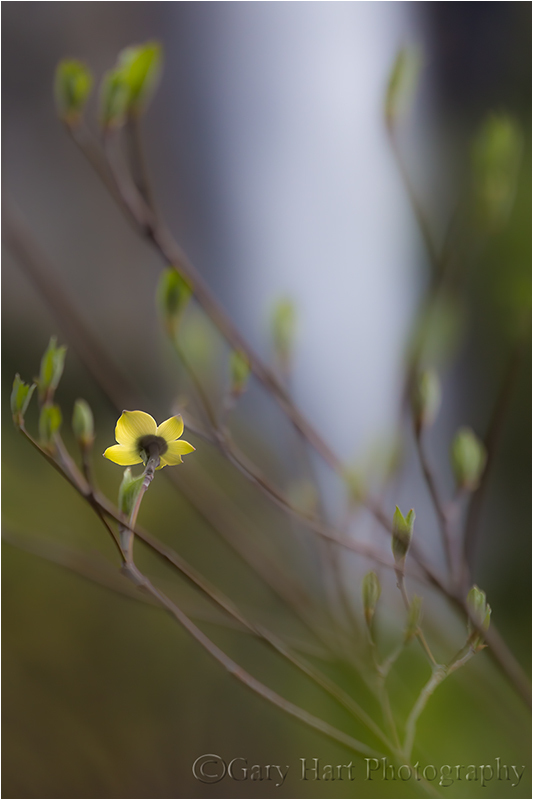 I found the more impressive aggregation of blooms were about ten feet too far downstream to align perfectly, but as I headed back to my car I took a closer look at a single, precocious little flower in a much more favorable position. I’d overlooked it earlier because, in my haste to get to the more impressive flowers, I wasn’t seeing like my camera. To my human eye, this flower was imprisoned by a jumble of disorganized, distracting stems. But this time I decided to give it a try, knowing that the narrow depth of field of my 100-400 lens would render the scene entirely differently from what my eyes saw. While the flower is clearly the only point of focus, the way the out-of-focus branches and buds blurred to shapes and accents that actually enhance the image was a pleasant surprise. While Bridalveil softens beyond recognition, I was pretty sure most viewers would still recognize it as a waterfall; even if they don’t, I didn’t think it was a distraction. Words can’t express how much fun I had playing with this little scene. I’ve been photographing things like this for a long time, but I still find myself caught off guard sometimes by the difference between my vision and my camera’s vision. I love these reminders. I guess if there’s a lesson here, it’s to emphasize how important it is to comprehend and master your camera’s very unique view of the world. Images that achieve that, while nothing like the human experience, are no less “true.” Rather than confirming what we already know, they expand our world by providing a fresh perspective of the familiar. More rain in the forecast tomorrow—guess where I’ll be…. When I arrived in Yosemite that morning a light rain was falling. 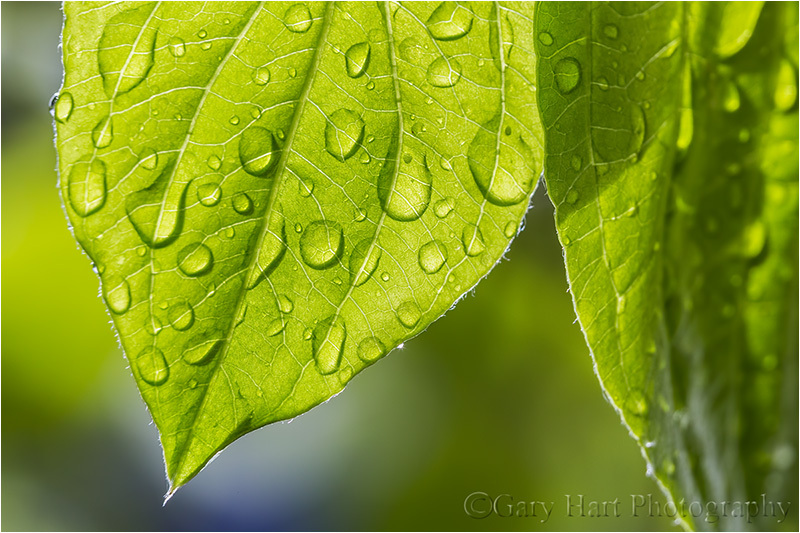 Used my 100mm macro and 20 mm of extension to focus extremely close to this backlit dogwood leaf. It’s difficult to see, but these droplets are actually on the opposite side of the leaf. There is one way to tell—can you see it?